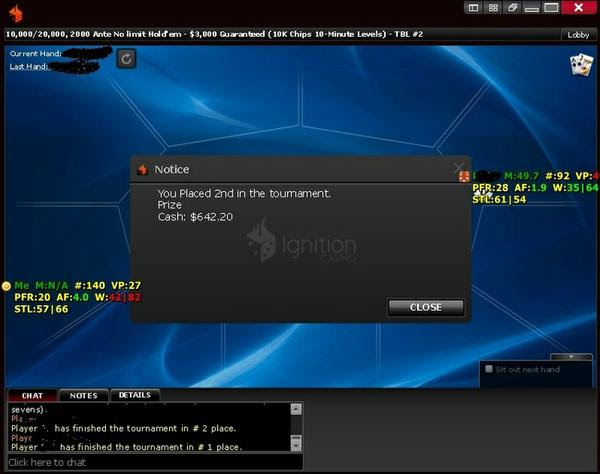 Ignition is one of the better sites for botting MTTs, running a consistent number of large-field events all day long including “guaranteed” and large-stack tourneys. This screenshot was sent to us by a customer using one of the standard MTT profiles from our forum after taking 2nd in the daily “$3,000 Guarantee” for a nice $642 cash. USA Players: America’s Cardroom, Black Chip, True Poker, BetOnline Poker, Sportsbetting.ag, and Ignition Casino.